Forget Kim Kardashian and her oversized bum, Zizzi almost broke the internet a few weeks ago when they revealed their new vegan menu. Vegans are used to visiting chain restaurants and adapting items already on the menu and asking the staff to omit cheese from their orders but Zizzi is the first (as far as I’m aware) to offer a vegan cheese on their pizzas. 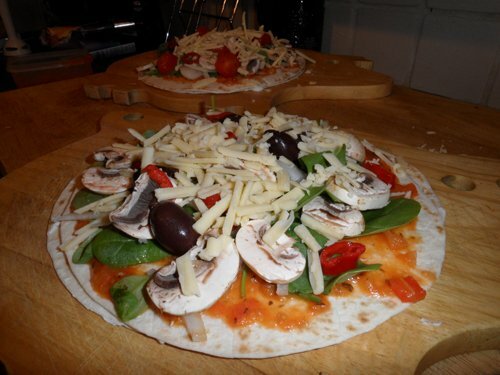 The vegan cheese is MozzaRisella, which is made from germinated whole rice made without milk and lactose, making it suitable for vegans and those who are allergic to dairy, gluten and soya. I’m neither vegan nor suffer from any allergies and although I make a conscious effort to eat fewer animal products, when it comes to eating out in restaurants, ‘without cheese please’ just doesn’t manage to leave my mouth when the waiter comes to take my order. So, when I heard about Zizzi’s new vegan pizza, I had to give it a go. A friend and I visited Zizzi in Charlotte Street, London and I’m hoping the smiley-but-slow service isn’t indicative of all their branches. The friendly waitress seated us immediately, handed us a couple of Zizzi’s usual menus but rushed off before I had a chance to ask for the vegan one. A long time passed until she came back for our drinks order, which gave me the chance to ask for the vegan menu which she immediately brought to me, but then we had a long wait for our wine to arrive (by the way, most of the wines are vegan and the ones that aren’t are listed on the menu). To be fair to the waitress(es) though, there did only seem to be two of them but, even so, the restaurant was empty and even the chefs were standing around in the kitchen not doing anything, so I’m not sure why the service was so slow. Slow service is one of my bugbears and the reason I no longer go into my local Pizza Express (I gave them four chances but the service never got any better). Still, we eventually managed to order and our shared starter of garlic bread arrived. 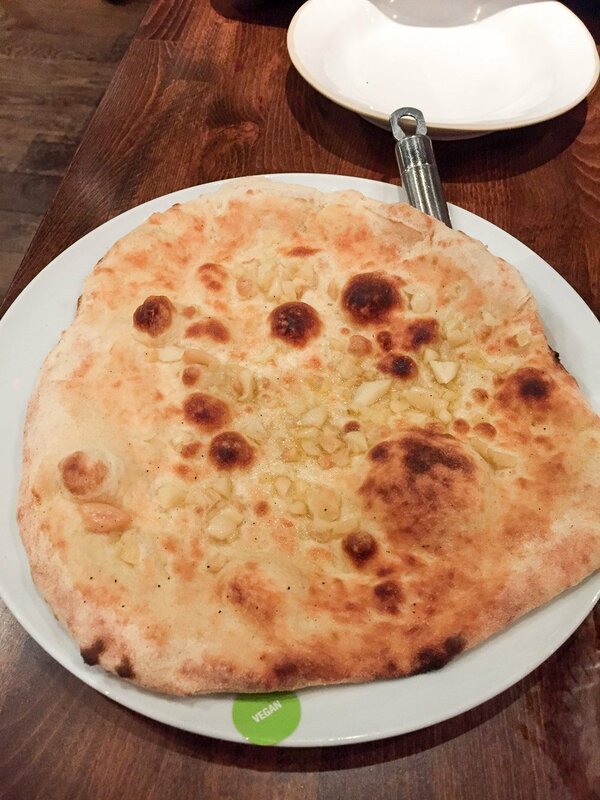 Despite – as you can see – the bread being covered in lumps of garlic, it wasn’t particularly garlicky and it was also a bit dry. I did like the green ‘vegan’ sticker stuck to the plate though (that’s as in ‘liked Zizzi thought of doing it’, not ‘mmm, yummy sticker’). But I didn’t go to Zizzi for their garlic bread, I went for the vegan cheese I’d heard so much about. 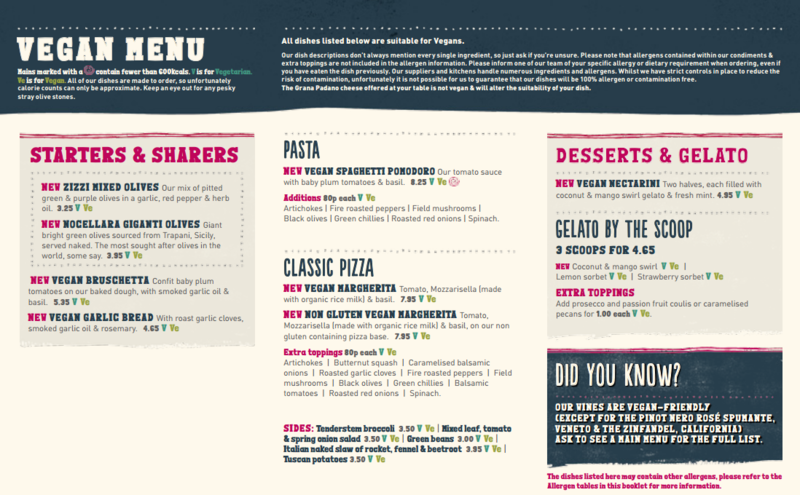 Zizzi offer a vegan Margherita (including a gluten-free option), onto which you can add your own toppings. Unfortunately, my pizza was a bit burnt and I considered sending it back as I hate burnt food even more than I hate slow service but given how long my pizza had taken to arrive, I kept it. Luckily, only a part of it was burnt and the rest of it was fine and I soon cheered up and enjoyed the rest of my pizza. 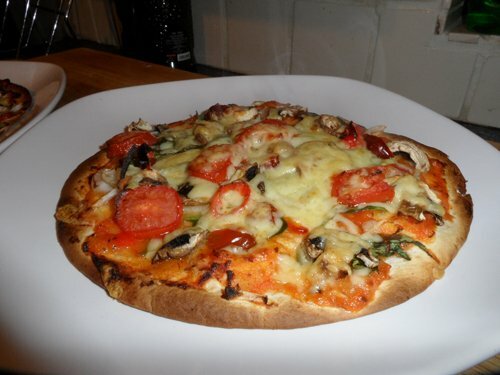 The vegan ‘cheese’ was more of a sauce and not the stretchy mozzarella pizza lovers have come to expect on their pizza but there are no complaints from me as it was tasty, cheesy and not artificial tasting at all (unlike a lot of vegan cheese). As someone who loves sauces and hates dry food, a sauce-like cheese on top of my pizza is fine with me. My vegan Margherita cost £7.95 and I chose toppings of olives, green chillies and mushrooms so, with toppings being 80p each, this meant my pizza came to £10.35 which is excellent value in my opinion, especially when a lot of pizza restaurants charge around £12 for a pizza and extra toppings at £1.50 a pop. Unfortunately, I can’t gush about the garlic bread and, at £4.50, I won’t be getting it again. I’d definitely go back for the vegan pizza though and hopefully more Italian/pizza restaurants and chains will follow Zizzi’s example and start offering vegan cheese on the menu. For more information about Zizzi, view their whole menu, find your nearest branch and book a table, visit the Zizzi website. 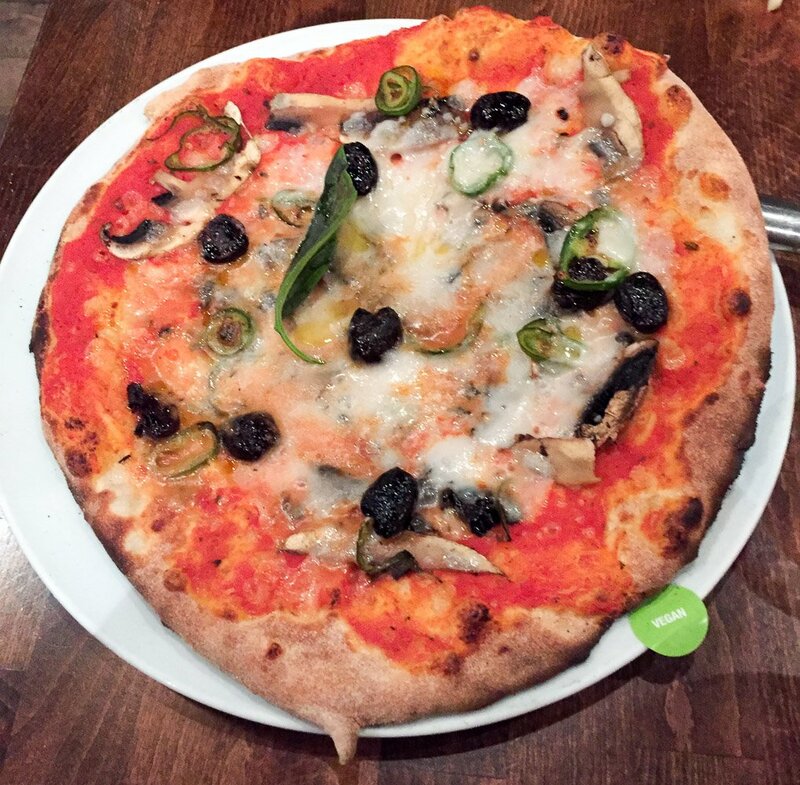 If you’ve been to Zizzi to try their vegan pizza, I’d love to know what you thought about it. 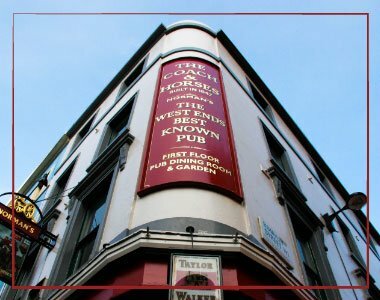 The ‘West End’s Best Known Pub’ is famous for a few reasons. Mostly for its legendary self-proclaimed ‘rudest landlord’ – Norman Balon – who reigned over the bar for 62 years before handing over the keys to its current owners in 2006, and also for its clientele of writerly types, including late columnist Jeffery Bernard (you’ll be pleased to hear I’m going to resist making *that*joke). 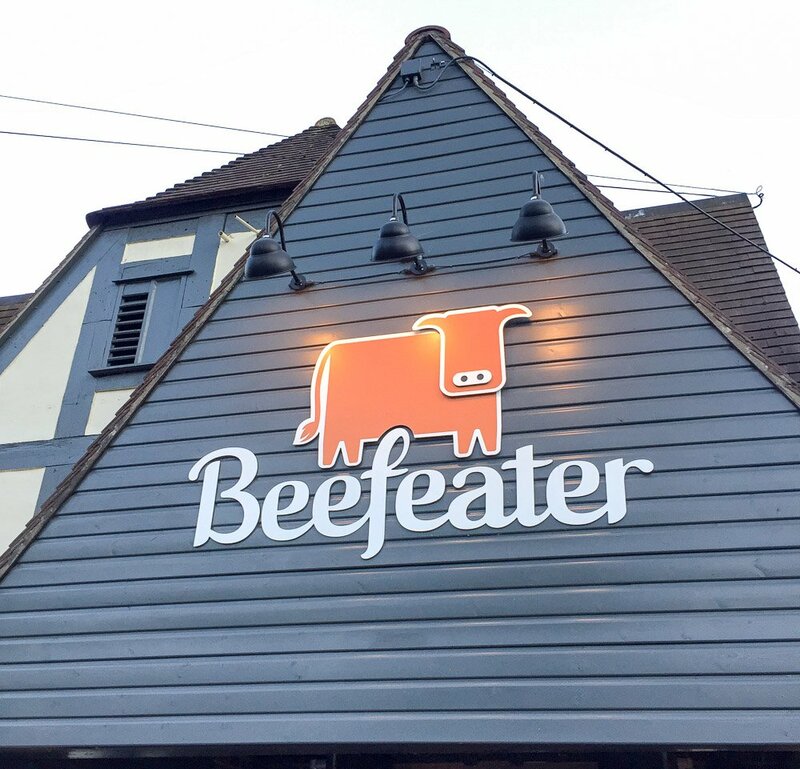 Now it’s famous for being London’s first vegetarian pub. ‘Vegetarian pub’ is a slight misnomer; on entering the pub, I spied a Guinness pump on the bar. As any self-respecting vegetarian will tell you – because it contains isinglass – Guinness isn’t vegetarian. For the uninitiated, isinglass is bits of fish bladder. Mmm, tasty. 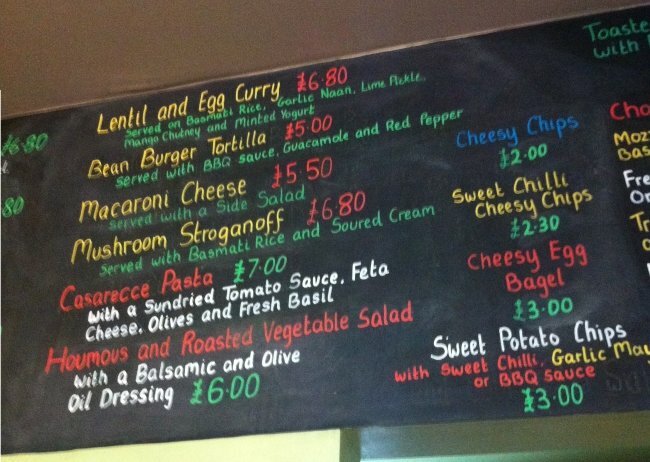 Pedantry aside, the menu served in the upstairs restaurant is 100% vegetarian, including customers’ favourites such as vegan tofush and chips, vegetarian pies and beetroot ravioli. Despite the downstairs bar serving non-vegetarian drinks, all the alcoholic drinks on the restaurant’s menu are labelled as suitable for vegetarians, with a few also labelled suitable for vegans. The entrance to the restaurant is behind the bar and, as the management isn’t keen on any old riff raff wandering about the staff only areas, you need to let a member of staff know you’d like a table, then they’ll show you up (to your table, that is; I don’t mean they embarrass you in front of your friends). The Coach & Horses hosts the Private Eye fortnightly lunches, which explains the Private Eye covers and photos of Ian Hislop adorning the walls. Ian Hislop aside though, the upstairs is charmingly decorated like a 50s tearoom. I’m informed by a friend who knows more about these things than I do, that the music is ‘ambient’. I’m not sure exactly what that means, but it’s certainly not something I’d listen to in my house. On entering the toilet, the first thing I notice is an art deco mirror, the likes of which can be seen in bedsits across the country. Old-style graffiti is scrawled on the door; my favourites being ‘I take it the cat went down the loo as there is no room to swing it’ and ‘Nigella Lawson is innocent’. The toilets were – to be blunt – downright disgusting, but as this is an old-fashioned boozer, not a high-end gastro pub, I can’t really complain. Not that I would complain, I’m far too British. I’d just moan to my mates about it. Or update my Facebook status. 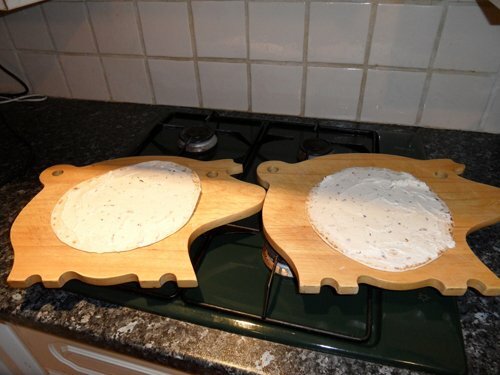 Our starters arrived quickly. My blue cheese quiche was luke warm; I’m not sure if it was supposed to be but I don’t like food that can’t make its mind up. Be hot or cold but not in between. The apple and cranberry chutney it came with certainly knew what it was – it was so cold it set my teeth on edge. The quiche was fine but slightly lacked blue cheese flavour. 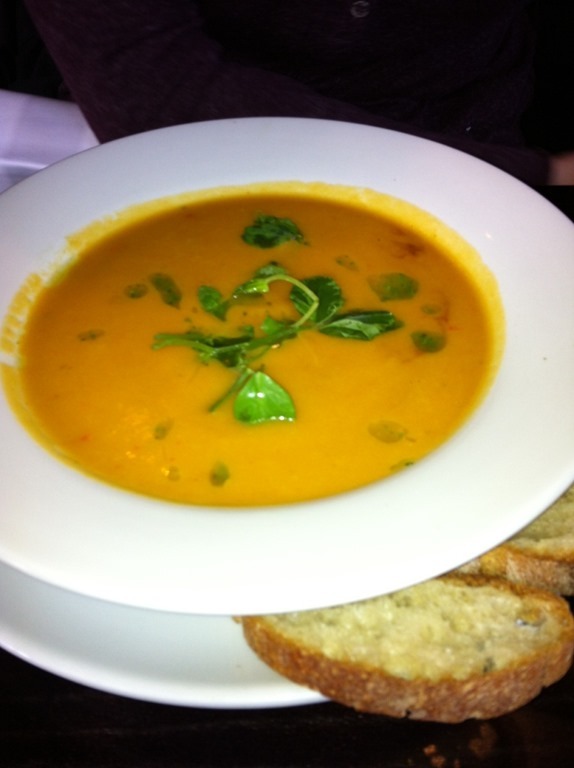 My friend described her soup of the day as, ‘Okay but the chickpeas were a bit hard’ but we were impressed that the bread accompanying the soup came with a choice of spreads; butter, or dairy-free for vegans and those (as in my friend’s case) who are dairy intolerant. After a long wait, our main meals arrived. 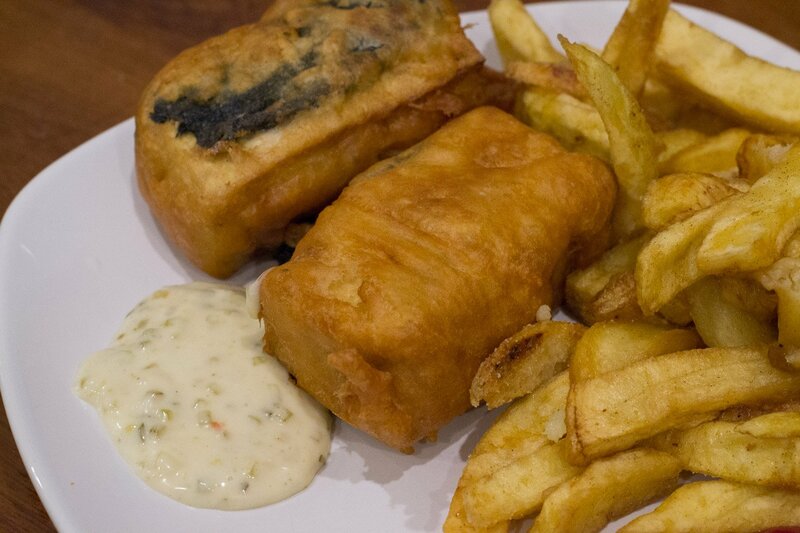 I’d been looking forward all day to the tofush and chips (tofu wrapped in seaweed and battered with organic ale batter, served with minted peas and avocado tartar sauce). The tofush was fab and even better than I’d remembered but the chips were obviously mass-produced frozen ones. They’re certainly missing a trick here by not serving homemade wedges or Heston-esque twice (or is it thrice?) cooked handcut chips. 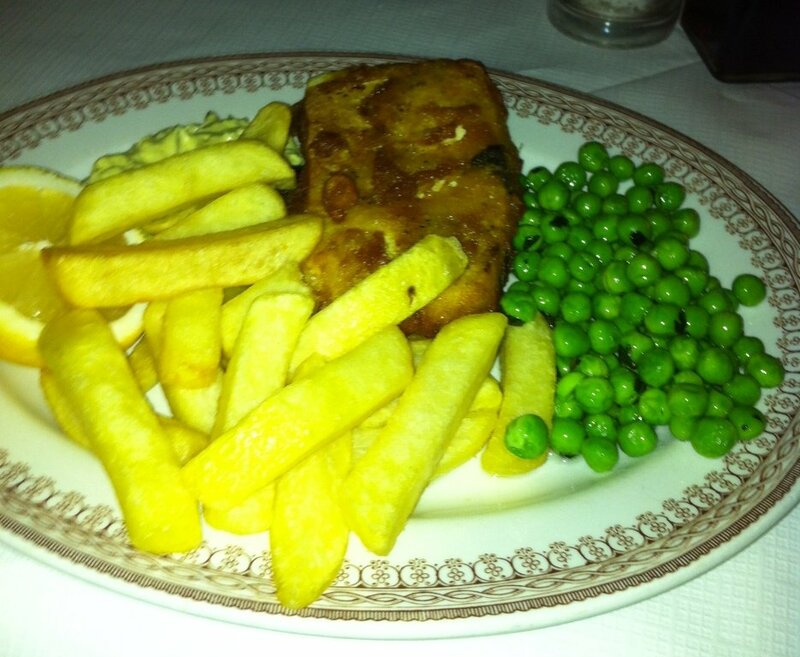 I loved the avocado tartar sauce, despite me usually hating avocado and the peas were, well, they were peas. I gave a bit of the tofush to my friend to try, warning her it would probably be too fishy for her. I was right; she screwed up her face and said, ‘Ew, too fishy.’ Well, she can’t say I didn’t warn her. My friend’s burger (chickpeas, red kidney beans, onion, carrot, garlic and paprika) arrived with a slice of halloumi, despite her asking for it to be left out. It didn’t particularly bother her as she’s not vegan, but said if she was a vegan, she wouldn’t be very happy. I was happy though – delighted, even – as I love halloumi, so she gave it to me. She agreed the chips were rubbish and she wasn’t a fan of her burger either. ‘Too much bun and it wasn’t that nice a bun,’ she said and took the burger out of the bun to eat on its own but complained it was dry and bland. 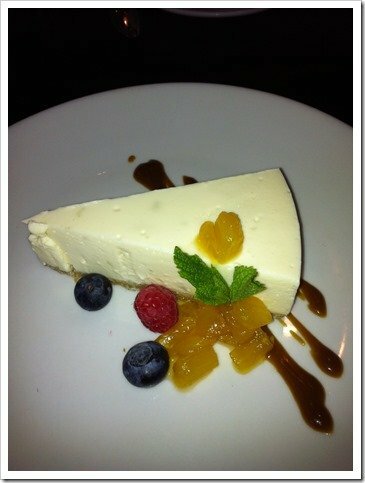 Free recipe with every mousse! 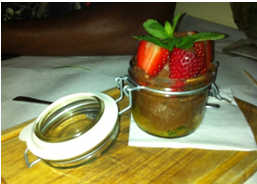 Our meals filled us up but I’d been eyeing up the vegan chocolate mousse on the dessert board. We decided to share one and it’s just as well we didn’t get one each as the mousse was huge as well as being wonderfully thick and rich. 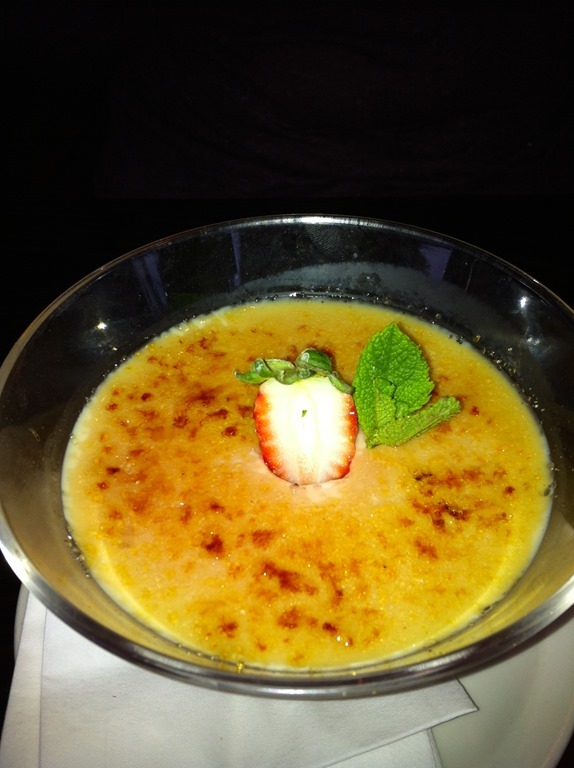 After telling the waitress how much we loved it, she wrote down the recipe for us. We left with our bellies full and our wallets about £28 lighter (not including drinks) between the two of us. I noticed on the way out four flavours of pickled eggs in jars behind the bar. I bet they all taste like mouldy balloons inside mouldy balloons though – I’ll stick to my tofush and chips, thanks. Mention Tontine Street to most Folkestone locals, and they’ll probably think of drug dealing, prostitution, sirens and street fights. They may also think of greasy spoons – there’s certainly enough of those here – but it’s doubtful they’d imagine there’s a lovely little vegetarian and vegan café tucked away next to the cheese-grater-esque Quarterhouse in Folkestone’s Creative Quarter. 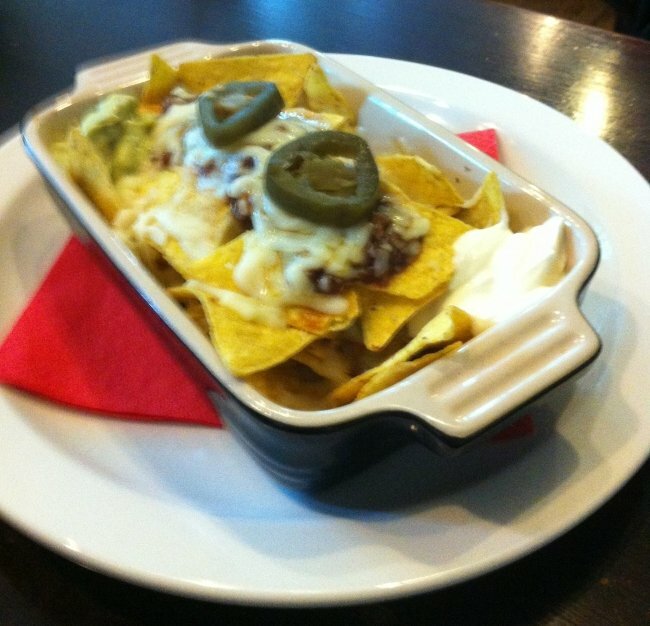 An eclectic mix of middle-aged ladies who lunch, bohemian studenty types and couples canoodling over their nachos. Vegetarian cafés generally fall into two camps. They’re either shabby shacks with menus full of lentils with a side serving of worthiness and shelves heaving with campaigning leaflets, or they’re simply great cafés that happen to also be vegetarian. Beano’s is definitely in the latter category. It’s so popular with veggies and carnivores alike that one of the meat-eating friends I’m with today eats at Beano’s so often, the owner greets him by name. Other meat-eating friends who have been nervous about eating in a vegetarian place have left wondering what they’d been worried about, while another friend admitted she hadn’t known until I’d mentioned I’d be reviewing Beano’s that it’s a vegetarian café, despite her having eaten here several times. 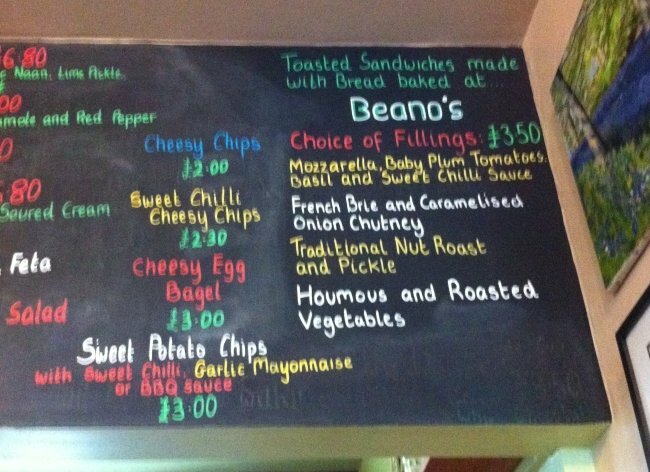 Despite the weather – it’s a wild, wet and windy day – Beano’s is full. It’s not full of drug dealers or prostitutes, either; there’s an eclectic mix of middle-aged ladies who lunch, bohemian studenty types and couples canoodling over their nachos. Beano’s may be busy, but the chatter is low, the background music soft, and conversation with my lunch companions is easily achieved. 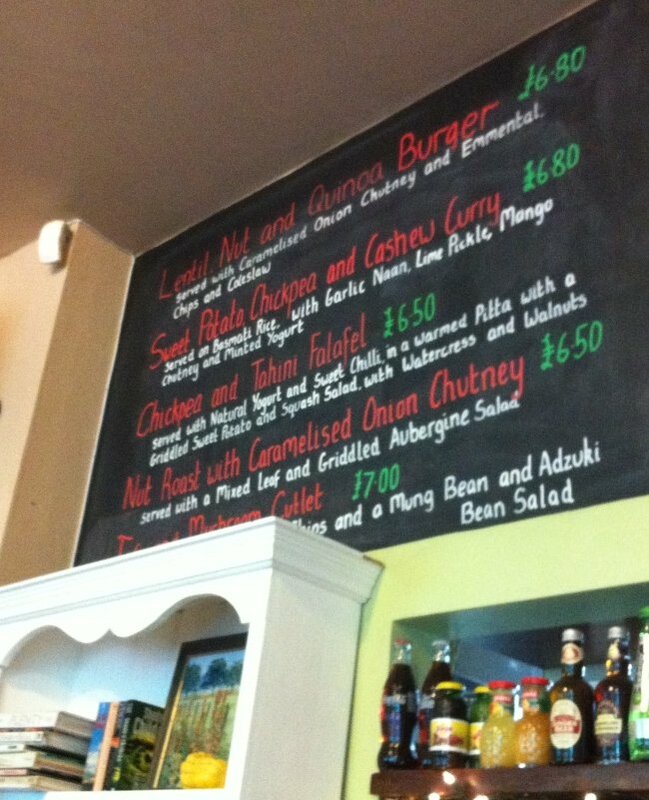 The 100% vegetarian and vegan menu, written on blackboards, clearly displays main meals, light bites and side dishes. There’s nothing here you won’t recognise, or anything to scare a carnivore. Chilli, burgers, and macaroni cheese are all on offer, or if you prefer something smaller, there’s a range of sandwiches, baguettes and panini. There’s also a large range of hot and cold drinks, including alcohol. 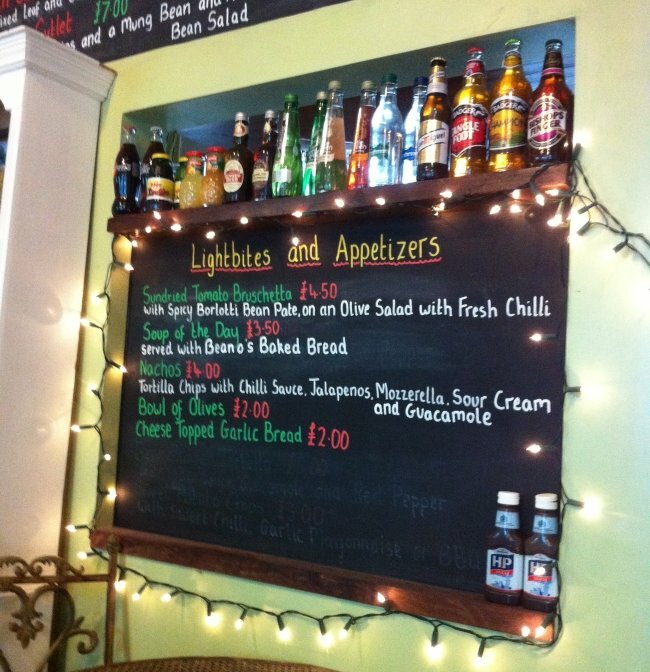 The interior is as eclectic as the clientele, without being pretentious. The walls are painted a tasteful pale green and an electric guitar hangs next to a collection of modern and old photographs. On another wall is a stripped pine dresser brimming with bric-a-brac and cookbooks by famous chefs including Jamie Oliver and Yotam Ottolenghi. 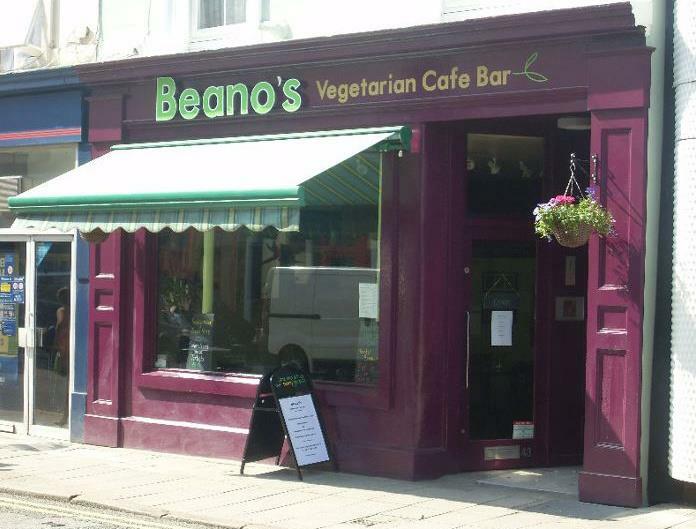 The fact Beano’s is willing to have books by *gasp* non-vegetarian chefs further exhibits Beano’s unpretentiousness – more snooty vegetarian establishments would stick firmly with displaying cookbooks by vegetarians only. Jo, who runs Beano’s with her husband Pete (who’s in the tiny kitchen at the back, doing the cooking), seats us quickly, takes our drink order, then leaves us to look at the menu. The bun is fresh, the burger is firm and topped with sweet caramelised onion chutney, along with creamy Emmenthal cheese and the homemade coleslaw is tangy and crisp. 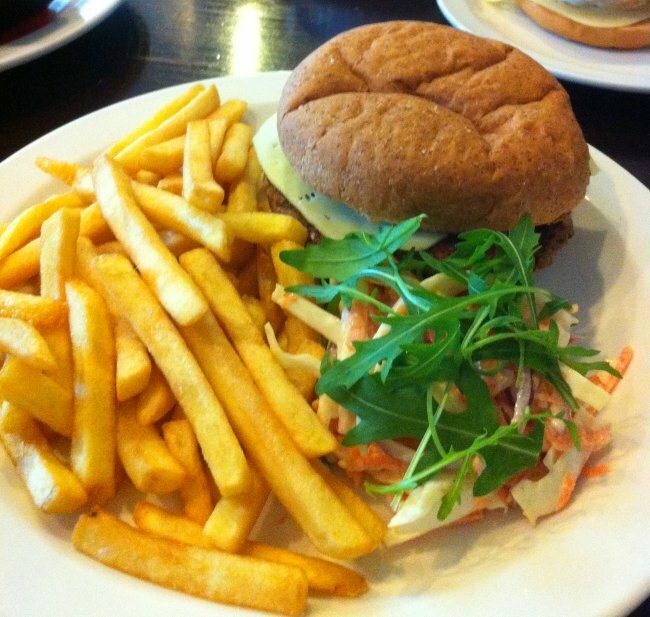 As I haven’t eaten yet today, the lentil, nut and quinoa burger with chips and coleslaw sounds suitably substantial. My companions declare they aren’t that hungry and order an eggy cheesy bagel each, along with a side of nachos to share. 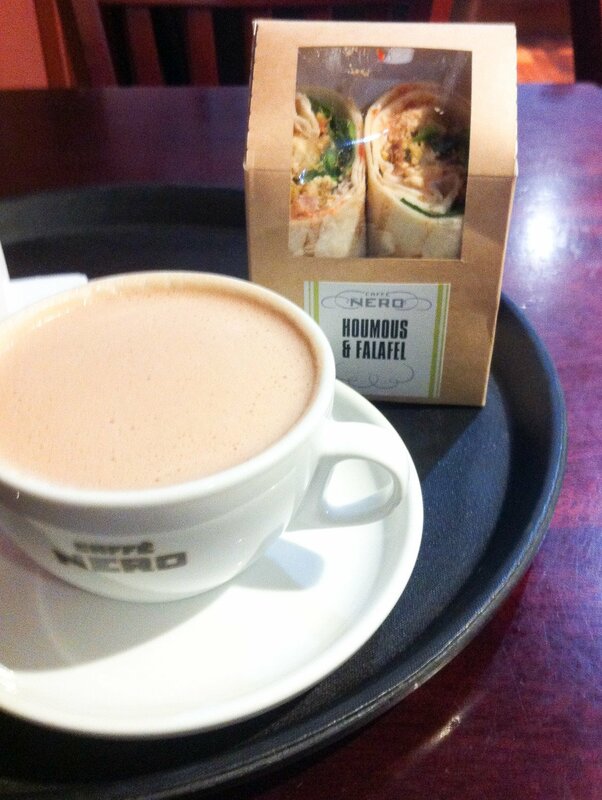 Considering how busy Beano’s is today and everything is freshly made on the premises, our food arrives quickly. 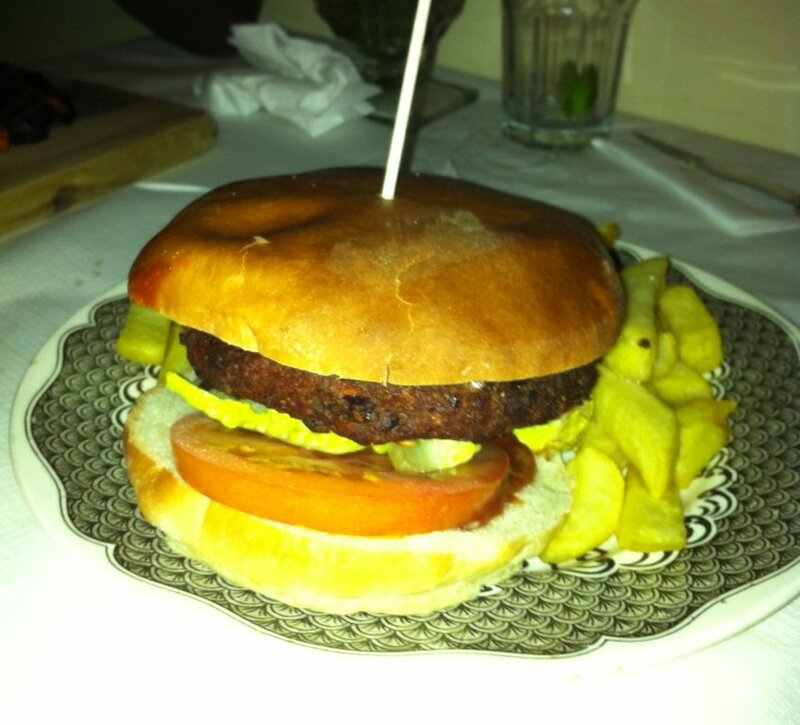 My quinoa burger doesn’t disappoint. 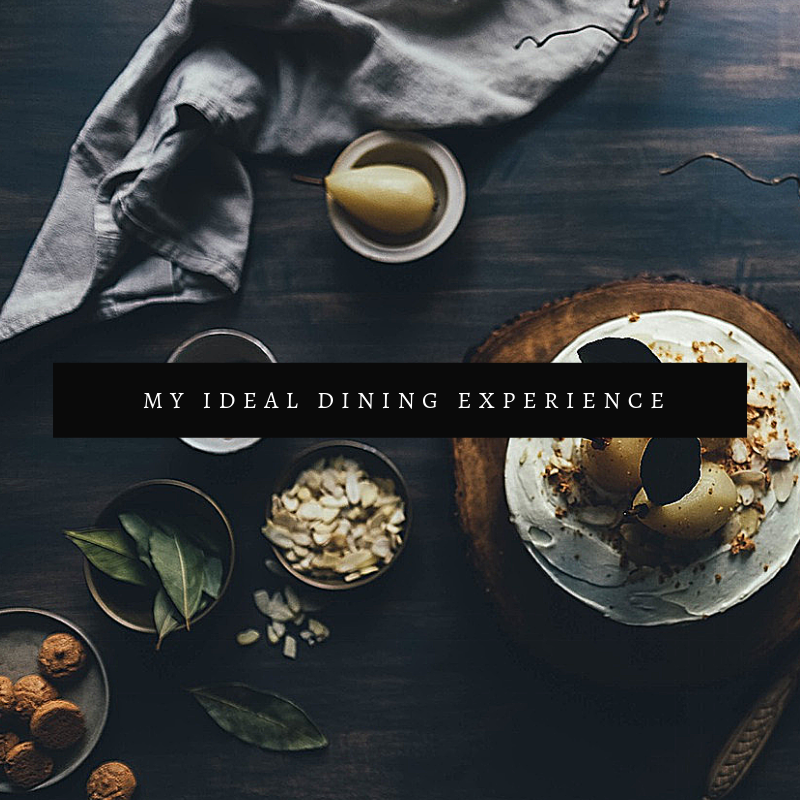 The bun is fresh, the burger is firm and topped with sweet caramelised onion chutney, along with creamy Emmenthal cheese and the homemade coleslaw is tangy and crisp. I ask my friends how their bagels are. 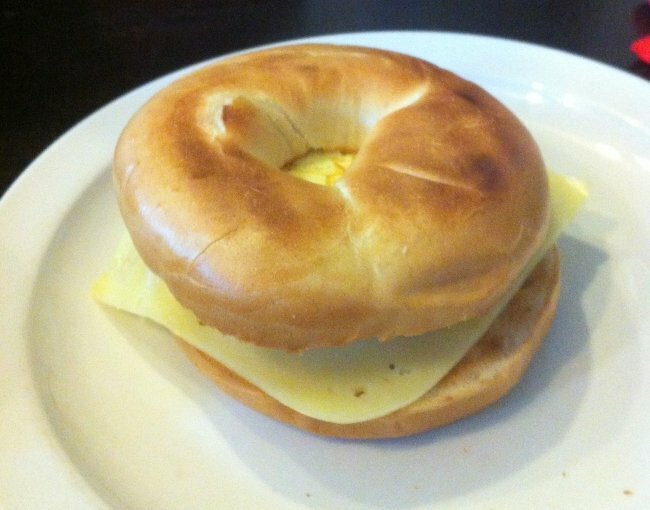 ‘Really nice’, ‘egg cooked just how I like it’, ‘the bagel is crisp and soft’, are their replies. Halfway through my meal, I put down my knife and fork, declare myself ‘stuffed’ and say I couldn’t eat another bite. 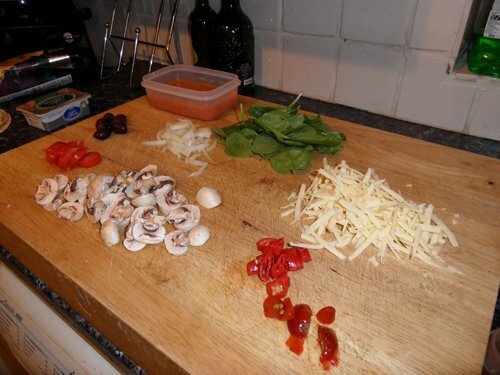 A few seconds later, I pick back up my cutlery and eat the rest of it. We’re in and out in an hour – satiated and just the right side of full. All for a reasonable sum, too. My hot chocolate, burger, chips and coleslaw came to £8.80. I email Jo later, asking about her choice of location. She says, ‘There were a few considerations involved, one of them being cost. But, looking back on all the locations we viewed, I would still choose Tontine Street. The area is definitely on the up and there is a sense of community that I enjoy being part of.’ She says her main aim is to make customers feel welcome, well looked after and to serve lovely food and coffee. I’d say she’s reached her aim. 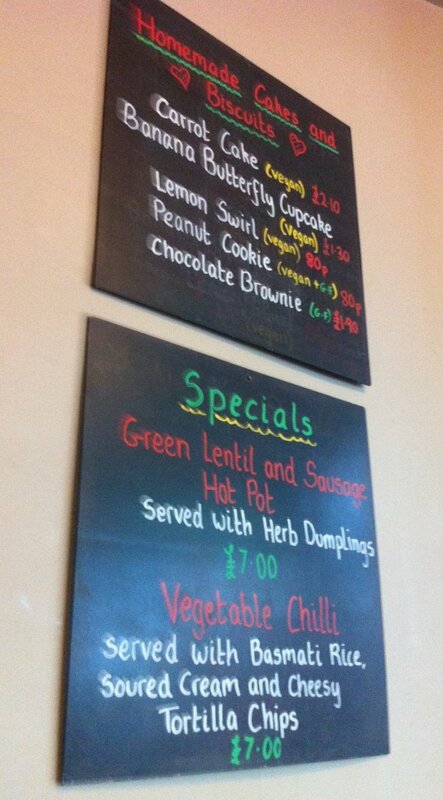 Back in 1999, The Gate Vegetarian restaurant in Hammersmith was the second vegetarian restaurant I’d ever been to. I never went again, mostly because it was in Hammersmith and I lived over the other side of London, so when I heard they’d opened a branch in Islington, I was keen to try it out. Despite booking a table for 6pm when it opened, there were already a few diners in there which I took as a good sign. We were seated quickly but then left for a long time before the waitress came back to take our orders and ask if we wanted drinks. 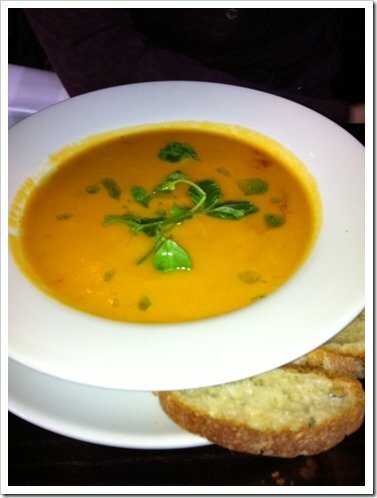 My friend, Tracey, asked what the soup of the day was. The waitress didn’t know, neither did the colleagues she asked. Eventually, a waiter came over who knew what the soup of the day was (sweet potato, coconut and chilli) which Tracey ordered, while I ordered the courgette flower. Never having a courgette flower before, I had flashbacks to when I was 13 round a friend’s house where her mum had given me broccoli which I’d never seen before as, in our house, petit pois were considered exotic. Which bit did I eat? The fuzzy bit or the stalky bit? Back when I was 13, I watched to see which bit my friend ate but now at 43, a bit of common sense told me that the stalky bit was the actual courgette and that could be eaten as well as the flower. Duh. 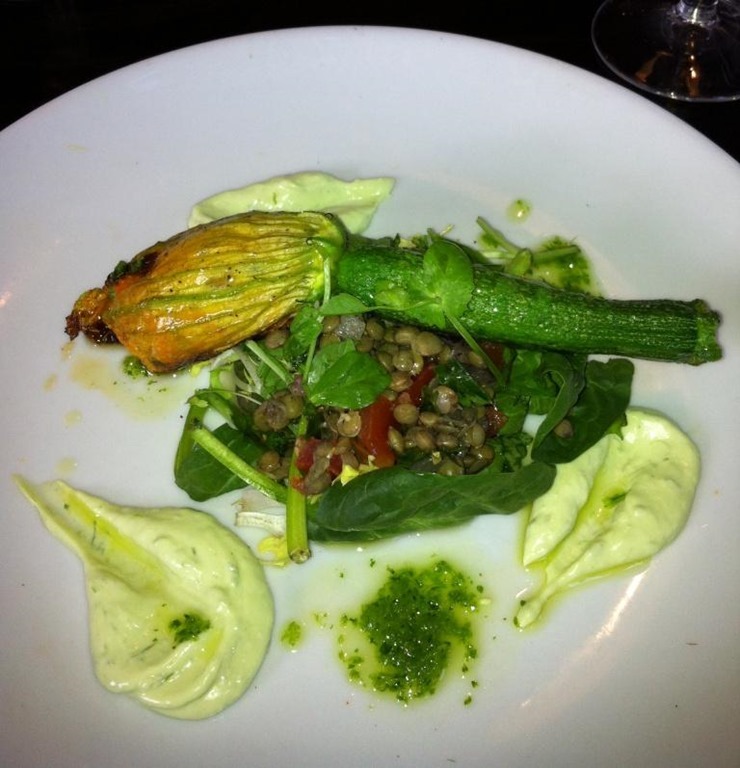 My courgette flower was filled with goats cheese, pine nuts, leek, basil & sun-dried tomatoes, served with lentil salsa & aioli and was absolutely gorgeous. 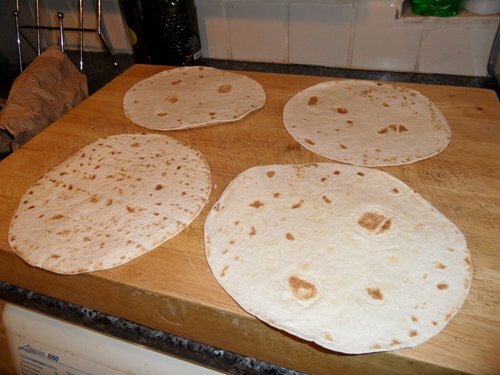 I loved it so much, I could have happily eaten another twenty-three of them. Tracey found her soup nice, but a bit sweet and she would have liked some black pepper. There was none of the table and the waitress hadn’t come over to ask if we needed anything. The waitress also didn’t ask if everything was okay when she came to clear away our starter, which wasn’t a problem as everything was indeed okay, it was just unusual. Saying that though, I’d far rather be ignored than have a waitress come over every five minutes to ask if everything’s all right. For my main, I had the panko aubergine. 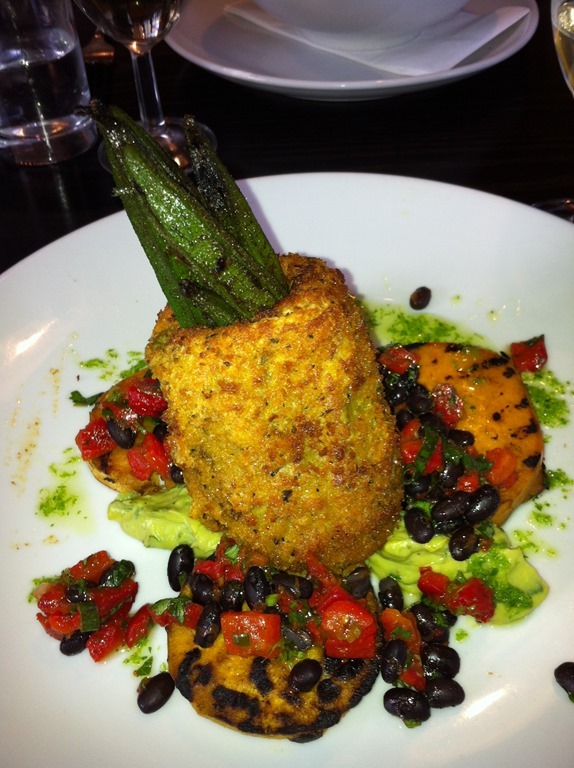 This is a panko and cajun-coated aubergine filled with okra on a bed of char-grilled sweet potato and finished with a black bean, red pepper salsa & guacamole. 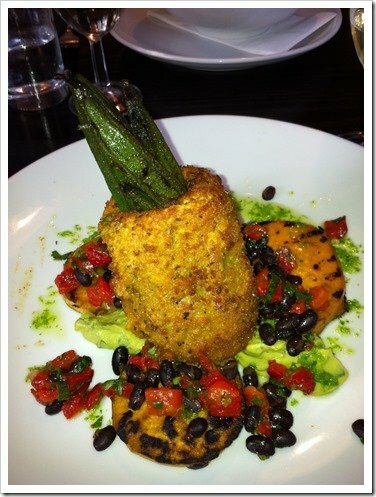 The panko crumb was beautifully golden and crispy and I even ate the guacamole, which I usually hate. So, well done The Gate – you have cured me of my hatred of guacamole – I may even try it again one day. 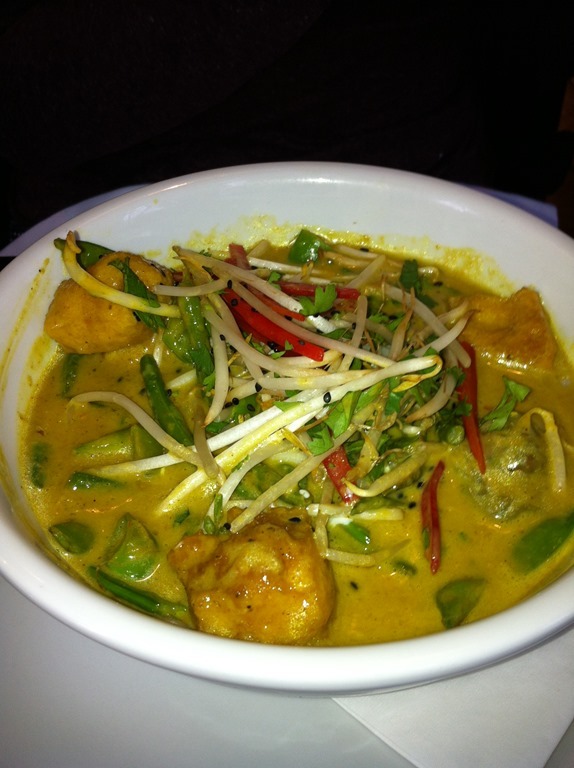 Tracey’s green vegetable laksa was a bowl of mange-tout, green beans, snow peas, tofu, rice noodles, poached egg & bean sprouts cooked in a Malaysian-style coconut broth, served with water chestnut and aubergine wontons. She said it tasted nice but the tofu was a bit chewy (I can confirm it was a bit chewy but I’ve had far worse – especially if I’ve made it). Although the food wasn’t heavy and seemed a light meal, by the time we were finished we were full. As in proper full. 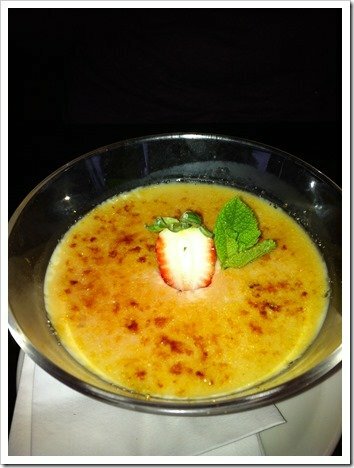 Despite this though, we decided to pig out and have dessert. 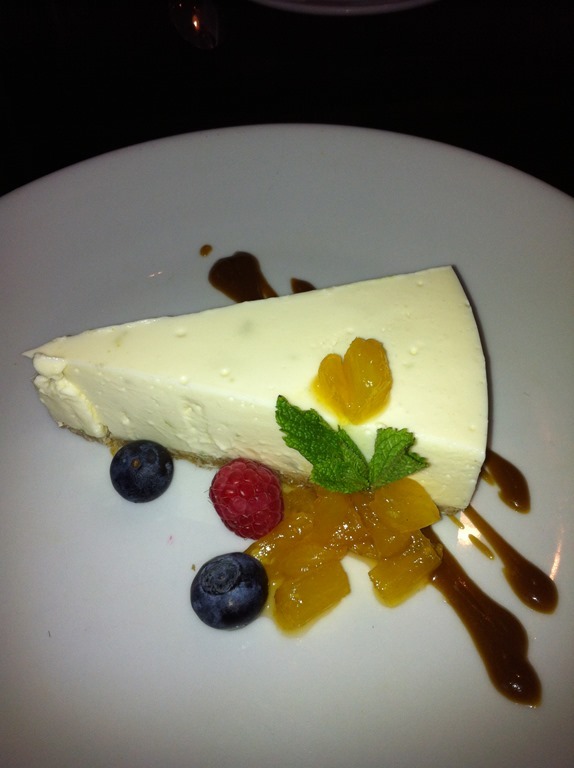 I ordered the lime and coconut cheesecake which was creamy, smooth and cool but had no discernable taste of coconut or lime. Tracey was disappointed her vegan fruit trifle had no lumps of fruit in it but she liked the vegan cream. You won’t get a quick meal in The Gate; we were in there for nearly two hours. 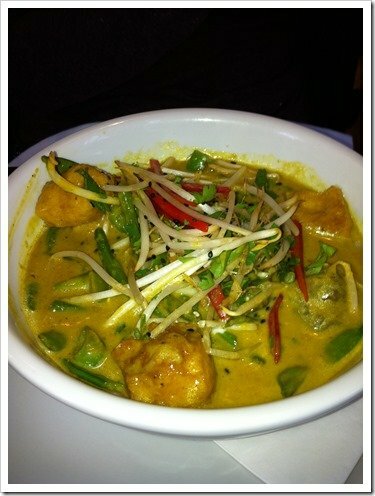 But if you want to linger over some good vegetarian food and wine, then The Gate’s for you. 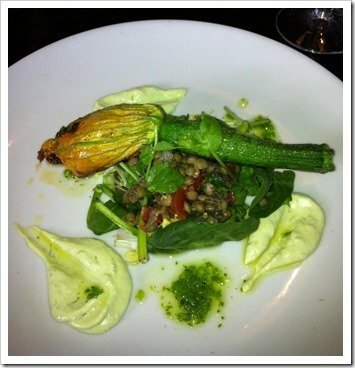 Just make sure you get the courgette flower. Our bill came to about £80 for the two of us for a starter, main and dessert each, plus a bottle of wine. During National Vegetarian Week (20-26 May 2013) The Gate are offering 20% off their Express Lunch Menu and 25% off their cookbooks. Two weeks ago, I ran the Folkestone Half Marathon (I might will blog about it later). Afterwards, seven of us went for lunch at Googies Art Café, a fantastic café bar in Folkestone’s Creative Quarter. 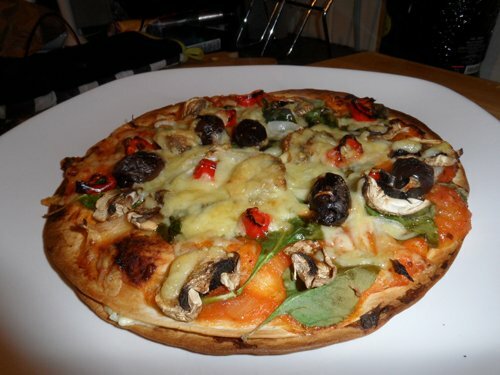 Most of our group opted for burgers (which Googies do in a wrap, rather than a bun) but as I’d had one of their burgers (halloumi and mushroom, served with spicy potatoes) a few weeks previously, I decided to try one of their weird-sounding pizzas. 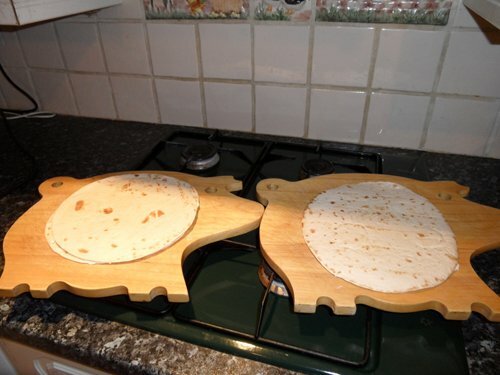 They sound weird because the base isn’t made of regular pizza dough, but two tortilla wraps, with cream cheese spread in between them. 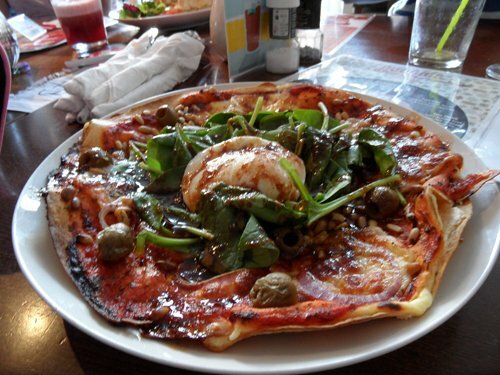 I chose the Florentina pizza which is topped with spinach, red onion, olives, pine nuts, mozzarella and a free range egg. I decided I would try and recreate it for myself and so last night, that’s what I did (although with different toppings). Rich (Cassie’s lovely ginger husband (Cassie says everyone should have a ginger husband)) asked for step-by-step photos, so here they are. Googies Art Café is at 15 Rendezvous Street, Folkestone CT20 1EY. Be sure to eat there if you’re in the area, then pop across the road to Johnny Cotter’s gallery and check out his amazing artwork.